Dry vermouth—it's hard to find another ingredient that is so important and yet so unloved by the masses. Vermouth is aromatized wine, and as any wine appreciator can tell you, once opened, it won't last forever. Oxidation begins immediately upon opening a bottle. For the first few hours oxygen might help elevate the flavors in a good wine, but what might have tasted great during the party is probably going down the drain the next morning—unless it was vacuum-pumped and sealed. Although vermouth is fortified with spirits, it still needs to be treated with respect. We doubt many readers treat theirs with the same care as a delicate wine. A warm cabinet and an opened bottle will quickly lead to horrible flavor. It's no wonder most people cringe at the mere mention of vermouth in their Martinis! If your vermouth has been collecting dust, unrefrigerated, it belongs in the trash, and certainly nowhere near our Drink of the Week. Sweet, Italian red vermouth may last longer in captivity than dry, French vermouth, but we are here to tell you that when it's fresh, vermouth can be wonderful—herbal, complex, and not an ingredient of displeasure. It's also inexpensive, so go ahead (we dare you) and open a new bottle to do a little taste test with your old stock. You'll recognize what we already know. Vermouth should be refrigerated, and the dry stuff should be loved and enjoyed quickly, or replaced before it goes south. Buy smaller bottles and use it while it's fresh. You may be surprised how good it can be, especially when you use it to make this drink. The Chrysanthemum cocktail which appears in the Savoy and is probably much older highlights the very best of a good bottle of dry vermouth. It's absolutely lovely. Stir with ice and strain into a chilled cocktail glass. Garnish with a big twist of orange peel making sure to spray the oils onto the surface of the drink. This recipe is also versatile, working well with different brands. We were feeling adventurous, so we tried a variation on this classic recipe by subbing Lillet Blanc for the vermouth. It's a sweeter option that benefits from a heavier pour and a little less Benedictine to keep the overall volume the same. 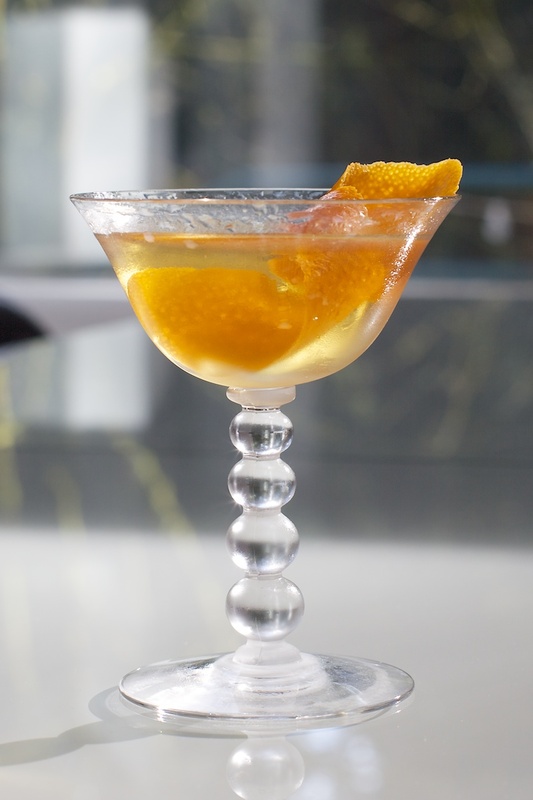 Despite using dry vermouth as a base, the Chrysanthemum is actually a sweet cocktail overall, but no more so than a sweet wine or glass of juice. You can obviously adjust that by varying the liqueur, but the complexity of this drink may surprise you. It has enough character to stand up to other cocktails with more alcohol and we rather enjoy its delicate nature. To our taste, three things stand out. The first is the herbal flavors brought out by the Benedictine. If you are unfamiliar with DOM Benedictine, it definitely deserves a little shelf space in your cabinet. The sweet complexity builds upon the same aspects in the vermouth and turns an otherwise dry cocktail into a sweet one. The second big flavor component is the absinthe. We opted to give our glass an absinthe rinse by rolling a small amount around the inside surface of the glass and discarding it, similar to a Sazerac preparation. It doesn't seem like much, but a mere three dashes of absinthe is enough to elevate the herbal flavors and produce a huge floral character that adds another dimension to this drink that would be sorely missed without it. Finally, our garnish plays a very important role by bringing a citrus explosion to the glass. Be sure to give your peel a good squeeze spraying orange oil across the surface of the drink. Then, take a moment to rub the peel around the rim before dropping it in to ensure each sip includes the benefit of oranges. At this point, you are hopefully reading along thinking this sounds too good to be true. A vermouth cocktail with this much going on? And it's good? You better believe it is. It's also a great candidate for barrel aging. We recently tried one at Clyde Common that had spent a month or more in a barrel. Yeah, it oxidizes a bit while in the wood, but the result is worth it! That sounds like a great idea. Do you know, is he adding any additional base to kick up the alcohol? No other base spirits added, though I'm not sure if he tweaked ratios. He told me he has been intrigued by making more food friendly drinks and wants to create a seperate drink list for Bachelor Farmer with more of his hyperdilute drinks like the Gatsby and drinks like this that don't overwhelm your palate. A fabulous drink which showcases the few but very potent ingredients in an amazing way. Does it get its name from the yellow disc flowers of the chrysanthemum flower? It's a bit hard to say which ingredient stands out the most but the vermouth is of course evident. I used Noilly Prat. The numerous spices from the Benedictine comes second, but the orange peel oils or maybe the absinthe are also evident. It's a bit on the sweet side and next time I make it I might pull down the Benedictine to .75 oz. No doubt however that this is a wonderous mix. Paul, if you like this one, try the Anthurium. Please, oh please, tell me where to find the glass used in the Chrysanthemum cocktail? Abby, we don't sell this glass in the Summit Sips store, but you should be able to find these in antique stores and on eBay if you know what to look for. This glass is called Candlewick. There are a few styles and several knock-offs, but they are all characterized by the glass spheres. One style uses the stacked glass spheres like the stem pictured here. Another style has the spheres arranges in a circle on the foot. Search for our post about Basil Oil Garnish and the Jackson Pollock cocktail for an example. That glass is quite different than this one, but still considered Candlewick. Finally, there is a style nicknamed "boopie" which has a molded foot with spheres all around. An example is pictured in the Sloe Gin Fizz post. These are quite common. All three types are Candlewick. You will find everything from punch bowls and platters to stems of various heights under the Candlewick name. Just be mindful in your search about how high the stem is. Shorter goblets are usually for sherbet or desserts while taller stems are for wine, champagne, or as we have them--cocktails.